Last week, the Mayor’s Fund were invited to Drapers’ Academy in Havering to support their in-school Count on Us Secondary Maths Challenge tournament! Over 50 pupils from across Years 8 & 9 were invited to take part in the tournament after having practised hard in Maths lessons. 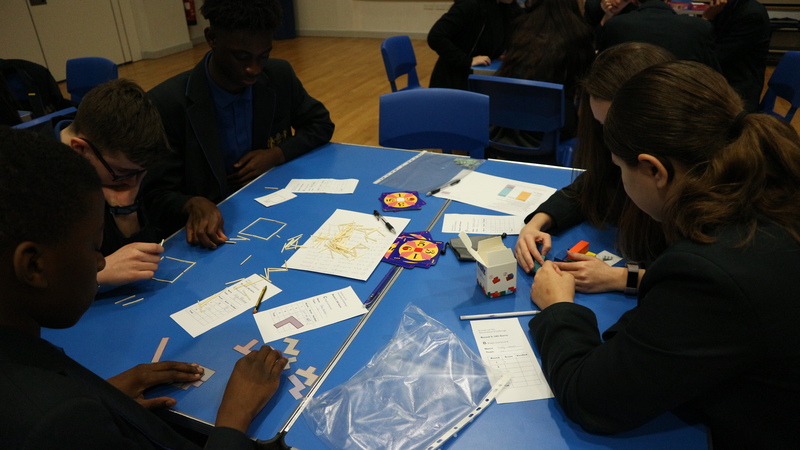 In a real three-round tournament, the pupils challenged each other to shape and geometry puzzles, the fast-paced and exciting 24 Game®, and then became problem-solvers in the elusive codebreaking round. Showing lots of resilience and enthusiasm, all pupils were aiming to qualify for the Drapers’ Academy school team, who’ll be going ahead to compete in the first round of the London-wide tournament in April. This is Drapers’ Academy’s third consecutive year of entering the Secondary Challenge, and motivation is high to make it through to the next stage. A big thank you to Ms Ahmed and her colleagues for organising the tournament, to the Sixth-Formers for acting as referees on the day, and most importantly to all the pupils who attended to show their love for maths. See you soon at the Regional Heats!